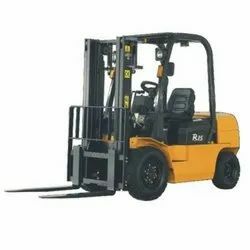 We are a leading Manufacturer of diesel fork lift, forklift trucks and forklift from Noida, India. The new generation Fork lift trucks are designed with durable hydraulics clean and reliable engine, progressive brakes, smooth and cool transmission with unmatched advanced features and ergonomics which save time and effort. Environment friendly design, easy servicing and maintenance ,high efficiency on the job as per the latest international safety standards. These fork lift trucks are designed for the most demanding applications. Advanced design, highly efficient control system and latest vibration reduction technologies provide extra comfort and ease in operation . Full floating type hood design and vibration reduction devices for steering axle enable a more comfortable operation. Advanced Electronic-Hydraulic Forward -Reverse control design in torque converter models ensures less time and less effort in performing various operations. remarkably. The coolant temperature is reduced by 15% compared with other trucks. Looking for Diesel Fork Lift ?